Florida Survival Gardening: Planning a Food Forest? Don't Go Scorched Earth! I’ve recently been engaged in discussions with a couple of folks planning food forest systems… and there’s one question that keeps coming up. If you’re planting into an existing forest, I’d argue that it’s almost easier than starting with a bare field. I know. Starting with a bunch of huge oaks or towering poplars is daunting… but there are benefits to starting with an established and mature ecosystem. Yes, yes… I’m getting to it. Stop interrupting! A forest is more than trees. It’s a huge web of interactions. Birds, mammals, reptiles and insects fill a healthy piece of woodland… and things are even more complicated beneath the surface. In the trees’ “rhizosphere,” i.e., where the roots live, there’s an amazing diversity of microscopic activity going on. The complexity of a forest microecology is far beyond that of a simple lawn… and you’re going to want to keep those interactions going for optimum success in your project. Photo credit: Rusty Clark. CC license. 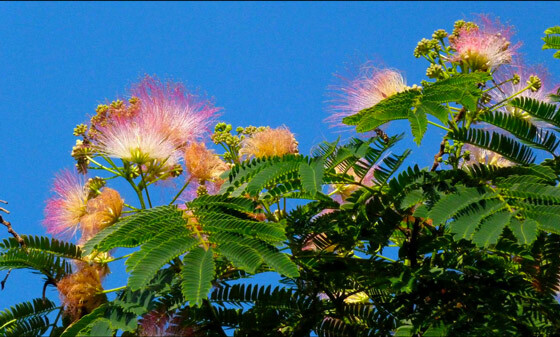 That’s a mimosa tree, also called a silk tree, known properly as Albizia julibrissin. It often grows in disturbed areas along roadsides, as an understory tree on forest edges, and right in the middle of your landscaping where you don’t want it. The tree is a prolific seeder and grows very rapidly. It will come back from the ground if you chop it down so killing it can be tough. That said… why kill it? Unless you’re a native plant purist and can’t stand to have your property defiled by an invader, there are some great uses for this tree. First of all, it’s a nitrogen-fixer. If you plant a fruit tree next to a mimosa tree, then chop the mimosa branches as they reach above the fruit tree, your fruit tree will do better than if it was planted alone. Every time you cut back a nitrogen-fixing tree, nitrogen is released as the root mass declines in response to the loss of canopy. Secondly, you can use the chopped branches as mulch around the base of your fruit tree… which leads me to my next point. If you have a forest, you have a lot of resources. One mistake I see people making all the time: they cut down trees and shrubs, then burn them to clear the ground. Don’t do that! You’re literally sending your soil fertility up in smoke. If you plant wanted species, then chop and drop the unwanted species to feed them, you’re saving on mulch and soil amendments as well as feeding the all-important soil microecology. At this point, I must confess: when I first bought my current property, I needed to clear some oaks to make way for my garden. Once they were felled, I was overwhelmed with the amount of debris so I burned it. The next year, I really got into the idea of hugelkultur beds and feeding rotten wood to my food forest. I kicked myself over that one. BUT – it’s never too late to repent. Even if you simply set aside logs and let them gracefully rot away into the ground, you’ll be adding greatly to the soil beneath. Have you had any terminate issues generally? I have construction friends warn me about keeping untreated random wood around like for hugelkultur or even raised beds (I use untreated, natural hard woods) in Florida. Also, update on the loquats - wife told me I had it all wrong, took me out to the plant, showed me that it was in fact full of little tiny fruit. We picked so much. Very delicious. I'm going to grow some of the seeds. Termites? Yeah... we always had termite issues, but they were here before any wood was added to the yard. They're everywhere. Great in the yard... bad in the house. Good deal with the loquat! This article is timely. I just started planning to change my front yard from all annual garden beds into a food forest. There's a ton of potential there. Are you going to keep posting in the future? Right! Pics or it didn't happen. You'll find the children start to inspire you to be outside as they get older. Mine are always following me around, planting seeds, etc.